Previously, when you set up a training block, other users could see when it had been applied to an athlete, but they couldn't copy it or make use of it themselves. A new "Privacy" Tick box enables you to keep it private or share it. Each new training block that you create, and all of your current training blocks, can be set up to be shared with other Professionals on your system. 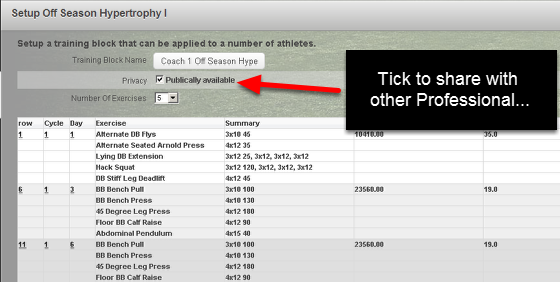 If you enable tick the Privacy - Publicly Available tick box, other coaches from your organisation will be able to apply that training block to their athletes and copy and then edit that copy (but NOT the original). If you are going to make it publicly available, please ensure you name your training block as accurately as possible. For example, you could use your initials and then describe the type of block that it is: VO2 Max enhancement programme, or 6-8 week leg speed strength etc. 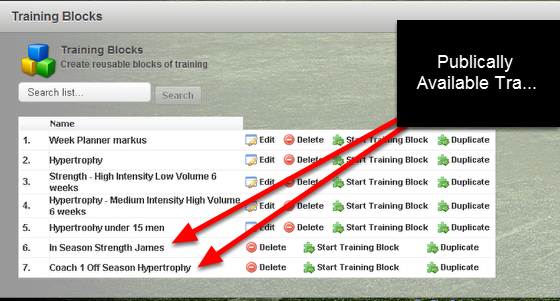 Only share important Training Blocks to avoid cluttering other users Training Blocks Pages. If you leave "Privacy -Publically available" unticked NO other users will be able to use this training block. It will not show in any other users training block list and they will not be able to duplicate or apply it. To enable other users to use and apply your training block, open an existing training block (by clicking on "Edit") then tick the "Privacy-Publically available" tick box and save the training block. It will now be available on other users Training Blocks Lists (as shown in the image below). 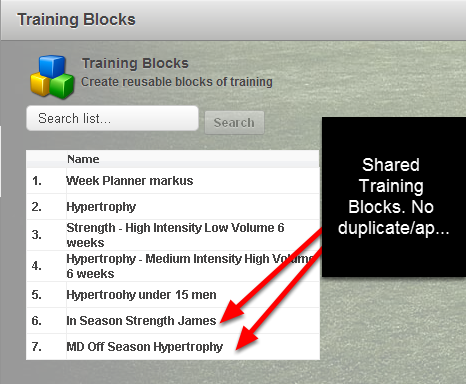 This example shows the In Season Strength James and the Coach 1 Off Season Hypertrophy Training Blocks have been shared by other professionals. 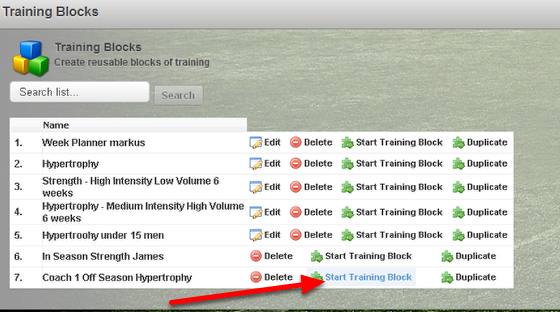 This user can now apply these training blocks to their own athletes (as shown in the image below) by clicking on "Start Training Block". They can also duplicate the training block by clicking on "Duplicate". Shared Training Blocks can be applied to their athletes. 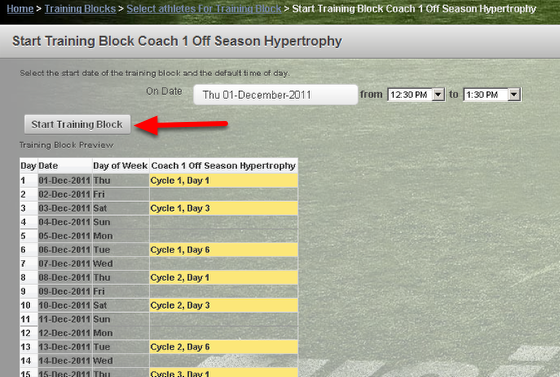 The example here shows that this user is applying a training block to their athletes by clicking on "Start Training Block". To apply a shared training block, the user selects the athletes and then selects the start date (On Date) and time and clicks "Start Training Block"
The image here shows the calendar of the athlete that they training block was applied to. Remember that the original training block is set up to be Publicly Available, so the new duplicate will also be set to be publicly available. On the new duplicate, the user may want to turn off the Publicly available until they have updated or amended the training block. Try and only share important training block to keep shared blocks to a minimum. If you choose to make your Training Block available to other Professionals on the system and they do not have access to the Event that you created the Training Block from, they will not be able to use the Training Block. 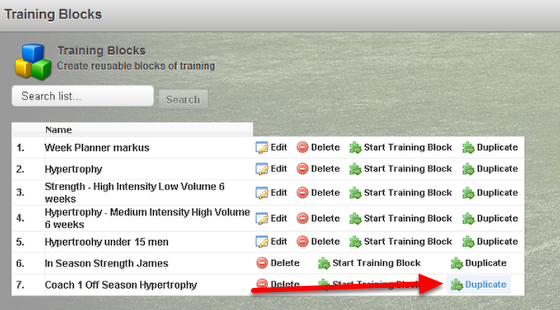 If you share a training block, and a professional does not have access to the event that it was created from (e.g if it was created from a special Resistance Training Form that the other user does not have access to) the training block name will appear there, but it will not show the duplicate button and it will not be able to be applied.